GOVERNMENT is appalled by the brazen insults and verbal abuse against Daily Nation proprietor Richard Sakala, journalist Wallen Simwaka and Chilufya Tayali of the Zambia Voice by UPND vice-president Geoffrey Bwalya Mwamba. Chief Government spokesperson Chishimba Kambwili has advised the UPND leadership to immediately take disciplinary action against Mr Mwamba if the opposition political party has to gain some credibility and respect from Zambians or face their electoral wrath in the August 11th general elections. Meanwhile, Mr Kambwili said UPND president Hakainde Hichilema’s desire to get to State House at all costs had blinded him from acknowledging the appreciation of the Kwacha in the recent past against major convertible currencies and the general improved outlook of the economy. Mr Kambwili, who is Information and Broadcasting Services Minister, said Mr Mwamba did not deserve to be in any kind of leadership position in the country because of his uncouth language against institutions and private citizens. He said it was frightening that Mr Mwamba had threatened to shut down the Daily Nation should the UPND form Government after the general elections in August and warned Zambians to strongly reject such kind of leadership. Speaking at a media briefing at his office yesterday, Mr Kambwili said it was frightening to imagine that Mr Mwamba could proudly be spewing invectives against citizens whom he was aspiring to lead. He said Mr Mwamba derived a lot of pleasure in insulting fellow citizens and that the UPND chances of ever coming close to forming Government had been severely damaged by his (Mwamba) uncouth and unpalatable language. Mr Kambwili said Mr Mwamba had exhibited the worst kind of hooliganism by calling citizens to verbally abuse them and proudly asking them to circulate his insults on social media so that as many Zambians as possible could listen how vulgar he was. “Zambians should expect the same standard of behavior from Mr Mwamba should the UPND form Government. 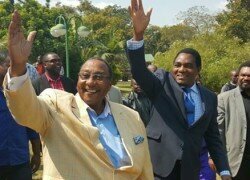 In fact, Mr Mwamba as republican vice-president would have no respect for any Zambian including his own president Hakainde Hichilema. Mr Mwamba derives a lot of pleasure in abusing citizens and if the UPND was a party of morals, it would be our expectation that they would take stern disciplinary action against Mr Mwamba because he is not making them desirable leaders. Hooliganism should not be tolerated in the UPND but we know that the party will not take any action for fear that the same insults could go to them,” Mr Kambwili said. Meanwhile, Mr Kambwili said the appreciation of the Kwacha was as a result of increased investor confidence and improved economic management by the PF Government as was evidenced by Glencore’s investment of K1.1 billion in Zambia. Mr Kambwili said the stable ratings by Fitch, austerity measures undertaken by Government, tight monitoring of open market operations by the Bank of Zambia coupled with the elimination of the manipulation of the exchange rate had contributed to the Kwacha gaining against the dollar. “President Edgar Lungu’s credibility and maturity in the way he has presided over the economic affairs of the country has resulted in the appreciation of the Kwacha. President Lungu’s continued dialogue with mine owners led to the revised Mining Royalty Tax and he authorized open talks between the Ministry of Finance and the International Monetary Fund (IMF) have shown confidence in the way the PF Government is managing the economy,” Mr Kambwili said.